Thanks to an Elks National Foundation Gratitude Grant, Hampton, Va., Lodge No. 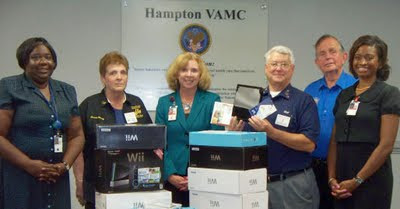 366 presented six Wii consoles to veterans at the Hampton VA Medical Center. The center is using these games for therapeutic and recreational purposes, helping the veterans to relax and enjoy themselves. The ENF awards $2,000 Gratitude Grants to Lodges to directly address local needs. Lodges are eligible to apply for Gratitude Grants after meeting the GER’s per-capita goal. To find out more about Gratitude Grants, visit www.elks.org/enf/community.